1009.4 Width. The width of stairways shall be determined as specified in section 1005.1, but such width shall not be less than 44 inches (1118mm). 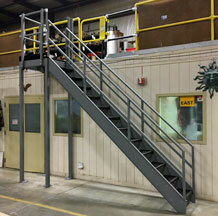 see section 1007.3 for accessible means of egress stairways. Stairways serving an occupant load of less than 50 shall have a width of not less than 36 inches (914 mm). 1009.5 Headroom. Stairways shall have a minimum headroom clearance of 80 inches (2032 mm) measured vertically from a line connecting the edge of the nosing’s. Such headroom shall be continuous above the stairway to the point where the line intersects the landing below, one tread depth beyond the bottom riser. The minimum clearance shall be maintained the full width of the stairway and landing. 1009.7.2 Riser height and tread depth. Stair riser heights shall be 7 inches (178mm) maximum and 4 inches (102mm) minimum . The riser height shall be measured vertically between the nosing’s of adjacent treads. Rectangular tread depths shall be 11 inches (279 mm) minimum measured horizontally between the vertical planes of the foremost projection of adjacent treads and at a right angle to the tread’s nosing. 1009.7.4 Dimensional uniformity. Stair tread and risers shall be of uniform size and shape. The tolerance between the largest and smallest riser height or between the largest and smallest tread depth shall not exceed 3/8 inch (9.5 mm) in any flight of stairs. 1009.7.5.3 Solid risers. Risers shall be solid. 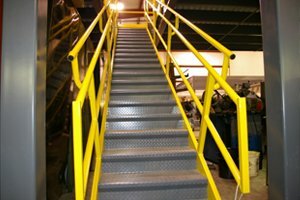 Solid risers are not required for stairways that are not required to comply with section 1007.3, provided that the opening between treads does not permit the passage of a sphere with a diameter of 4 inches (102 mm). 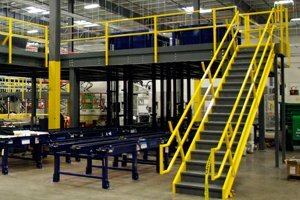 Solid risers are not required for occupancies in Group I-3 or in Group F, H and S occupancies other than areas accessible to the public. There are no restrictions on the size of the opening in the riser. 1009.8 Stairway landings. There shall be a floor or landing at the top and bottom of each stairway. The width of landings shall not be less than the width of the stairway. Where the stairway has a straight run the depth need not exceed 48 inches (1219 mm). 1012.1 Where required. Handrails for stairways and ramps shall be adequate in strength and attachment in accordance with section 1607.8. 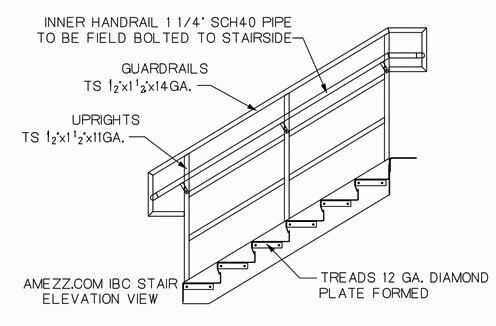 Handrails required for stairways by section 1009.15 shall comply with sections 1012.2 through 1012.9. Handrails required for ramps by section 1010.9 shall comply with sections 1012.2 through 1012.8. 1012.2 Height. Handrail height, measured above stair tread nosing’s, or finish surface of ramp slope, shall be uniform, not less than 34 inches (864 mm) and not more than 38 inches (965 mm). 1012.3.1 Type I. Handrails with circular cross section shall have an outside diameter of at least 1-1/4 inches (32mm) and not greater than 2 inches (51 mm). 1012.6 Handrail extensions. Handrails shall return to a wall, guard or the walking surface or shall be continuous to the handrail of an adjacent stair flight or ramp run. Where handrails are not continuous between flights, the handrails shall extend horizontally at least 12 inches (305 mm) beyond the top riser and continue to slope for the depth of one tread beyond the bottom riser. 1012.7 Clearance. Clear space between a handrail and a wall or other surface shall be a minimum of 1-1/2 inches (38 mm). 1013.1 General. Guards shall comply with the provisions of section 1013.2 through 1013.7. 1013.2 Where required. 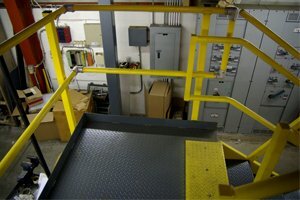 Guards shall be located along open-sided walking surfaces, including mezzanines, equipment platforms, stairs, ramps and landings that are located more than 30 inches (762 mm) measured vertically to the floor of grade below and point within 36 inches (914 mm) horizontally to the edge of the open side. Guards shall be adequate in strength and attachment in accordance with section 1607.8. 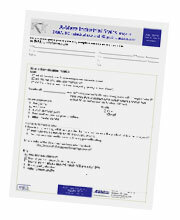 This information on this page is reproduced from the IBC code. A-Mezz Industrial Structures is not responsible for the accuracy of this information. This information is meant to serve as guide, not the authority of the International Building Code. For additional IBC clarification please contact your local building department.